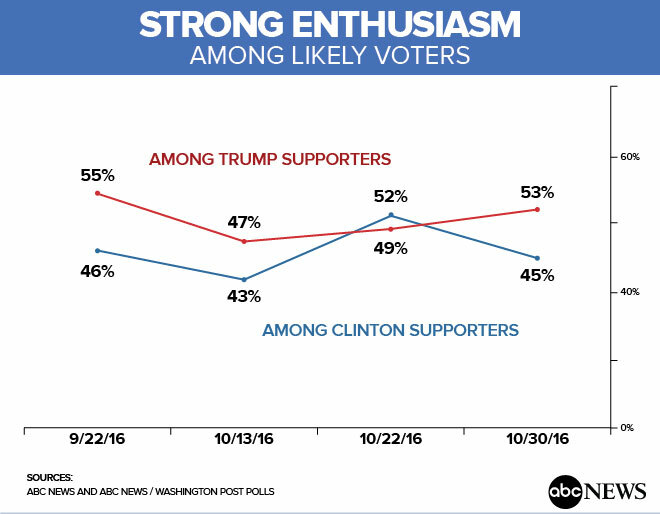 Enthusiasm for Clinton has ebbed since the renewal of the FBI’s investigation. In the latest results, 46 percent of likely voters support Trump, and 45 percent are for Clinton. With the data taken to a decimal place for illustrative purposes, a mere 0.7 of a percentage point divides them. Third-party candidate Gary Johnson has 3 percent, a new low; Jill Stein, 2 percent. Trump now leads Clinton by 8 points in the share of voters who are very enthusiastic about their choice as of Friday. But compared with past elections, it’s low for both of them — 53 percent for Trump, 45 percent for Clinton. Strong enthusiasm for Clinton has lost 7 points since the start of tracking, especially Friday through Sunday. This is possibly an effect of the renewed controversy over her use of a private email server while secretary of state. 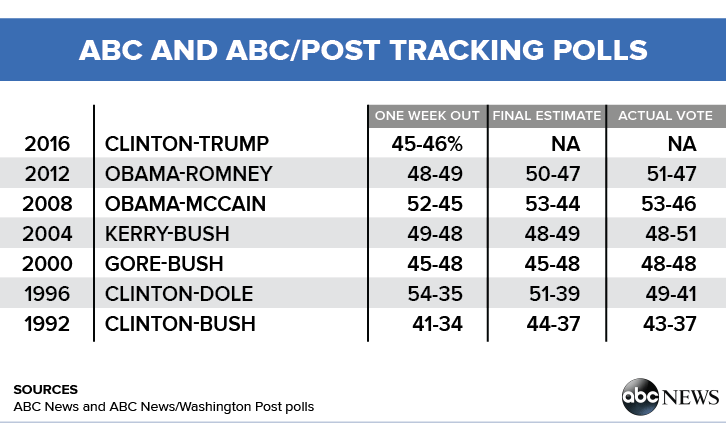 Trump’s strong enthusiasm has held steady in tracking, which started Oct. 20. The 1 point Clinton-Trump race is well within the survey’s margin of sampling error. Combining the last seven nights — across which results have been very stable — the results flip to 46 percent Clinton, 45 percent Trump, with a 0.4 point gap. Again, it is not a significant difference. Either way, the results are exceedingly close. Trump’s 1 point lead is a noteworthy result; he has led Clinton just once before, up 2 points in late May (among registered voters in a two-way test), after he clinched the GOP nomination while Clinton was still in a duel with Bernie Sanders in the Democratic race. Although the election is close at this point, vote preference results a week out are not necessarily predictive of the final result. Mitt Romney was up 1 versus Barack Obama in comparable tracking poll results in 2012, for example, and John Kerry was ahead by 1 against George Bush a week out in 2004. • In states considered to be strongly for Trump or leaning toward him (with a total of 180 Electoral College votes), he leads Clinton by a broad 60 to 34 percent. • In blue states (with 278 electoral votes), Clinton leads 54 to 37 percent. • In the five ABC-designated toss-up states (with 80 electoral votes) — Arizona, Florida, North Carolina, Ohio and Utah — voters split 41 percent Clinton to 48 percent Trump. That’s not a significant difference, given the 5.5 point error margin at this sample size. 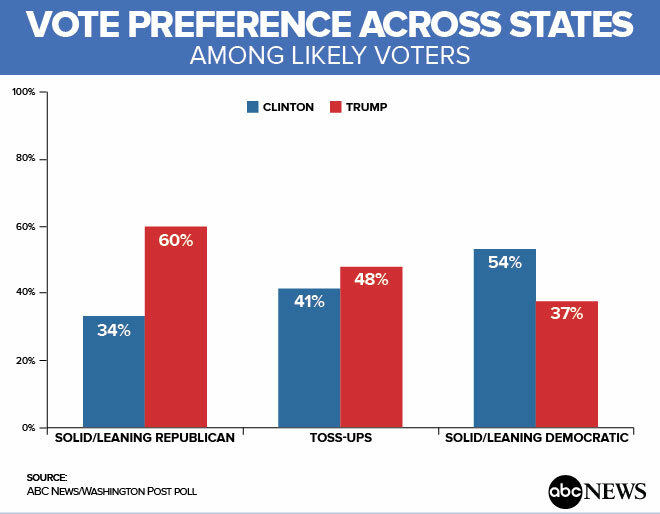 Clinton’s support rests in part on early voting: A fifth of those identified as likely voters (21 percent) say they have already voted. While the sample isn’t large (thus an error margin of +/–7 percentage points), they divide 55 percent for Clinton, 39 for Trump. That said, early voting estimates can change, given state rules, turnout and sampling variability. Early voting estimates in the 2012 ABC/Post tracking poll ranged from up 17 for Obama to up 4 for Romney in four-night averages, settling at up 3 for Obama. The latest results, while steady for seven nights, reflect a sharp turnaround from a large Clinton lead in the first four nights of tracking, which were a particularly difficult news cycle for Trump. Among other factors, there has been consolidation for Trump among Republicans and GOP-leaning independents (86 percent now back him, up from 80 percent). He has also seen improvement among pure independents (i.e., those who don’t lean toward either party), up from an even split to a large Trump advantage, 25 percent Clinton to 54 percent Trump, across the past seven nights (combined for a larger samples size). Seventeen percent of pure independents pick someone else. Among Democrats and Democratic leaners, meanwhile, Trump’s support has gone from 5 to 9 percent — a slight change, but a statistically significant one. Clinton’s support has been essentially steady. One, this narrows to a 5 point gap, 48 to 43 percent, when independents who lean toward one party or the other are included. The second is Trump’s advantage among pure independents, as noted — even though they account for just 7 percent of likely voters. And the third is that Trump wins 9 percent of Democrats and Democratic leaners, while Clinton is supported by 6 percent of Republicans and those who lean toward the GOP — another slight difference and not statistically significant. But in contests this close, small differences add up. Vote preference results are essentially identical in 23 likely voter models produced for diagnostic purposes, with turnout estimates ranging from 43 to 81 percent of the voting-age population. Seventeen of the models produce a 46 percent Trump, 45 percent Clinton race, as does the average of all 23. 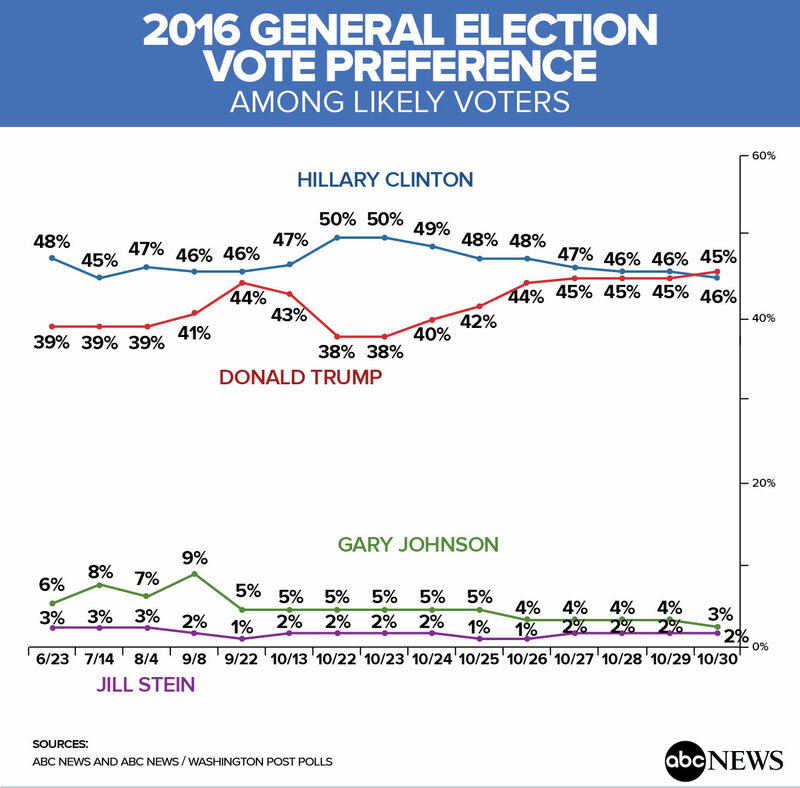 This ABC News/Washington Post poll was conducted by landline and cellular telephone Oct. 27 to 30, 2016, in English and Spanish, among a random national sample of 1,128 likely voters. Results have a margin of sampling error of 3 points, including the design effect. Partisan divisions are 38-28-29 percent, Democrats-Republicans-independents. Questions 5a and 5b were asked Oct. 28 to 30 among 388 and 397 Clinton and Trump supporters, respectively; they both have 5.5 point error margins. The survey was produced for ABC News by Langer Research Associates of New York City, with sampling, data collection and tabulation by Abt-SRBI of New York City. See details on the survey’s methodology here.